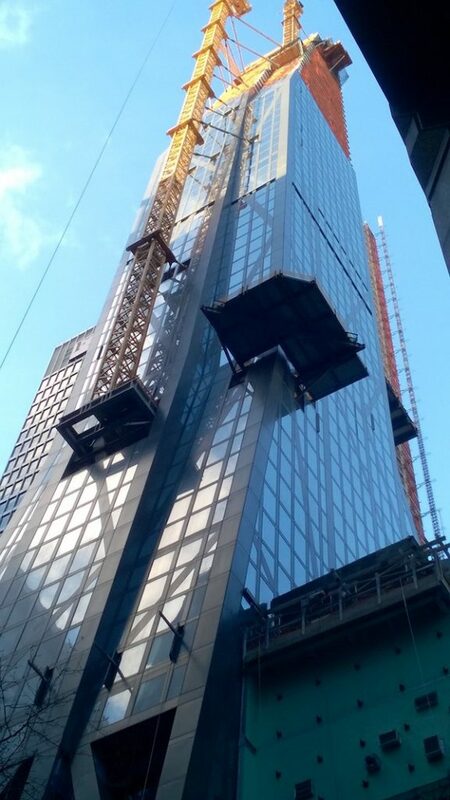 New York is perhaps the city most synonymous with skyscrapers in the public imagination, and the most architecturally significant addition to the New York skyline in recent years is at 53 West 53rd. This exciting project has been conceived by Pritzker Prize-winning architect Jean Nouvel as both an heir to the classic towers that shaped the New York skyline and as an aesthetic and technological innovation paving the way for the skyscrapers of the future. The multiple tapered facades of 53 West 53rd make it angular yet graceful and sure to be an iconic part of the cityscape. The residential building rises 320 metres above the world-renowned Museum of Modern Art and, with an innovative exposed structural system and floor-to-ceiling windows, offers stunning new vistas over Central Park and the Manhattan skyline. All of these features make effective facade access vital to the continuing preservation of the architect’s vision and the enjoyment of residents. The particular challenge for CoxGomyl on this project was to provide a comprehensive building access system with two Building Maintenance Units (BMUs) which were both required to fit within compact predetermined spaces at level 76 and level 77, and were also required to be hidden behind doors when parked. Utilising our experience and engineering expertise, CoxGomyl undertook the additional scope of design and supply of the doors in order to ensure conformity and compatibility of the building access system as a whole. The level 76 Building Maintenance Unit is designed to provide facade access to most areas, utilising a complex drop strategy and a combination of procedures to deliver access to the entire curtain wall. It is stabilised using mullion guides and a series of side-shifting and transition capabilities allow it to navigate the facade. The compact parking space made the minimum and maximum reach of the machine a critical issue and it achieves an impressive range of 7 metres in parked configuration to a maximum reach of 35 metres when in use. The machine is concealed behind four powered doors which are designed to maximise the parking space available. Two doors open inwards and roll above the BMU, while the other two fold down to allow it to reach out of the building. The additional Building Maintenance Unit at level 77 will service the peak of the building down to where the first machine reaches. Again, a very confined parking space presented a challenge with the opening limited to a height of just 2.5 metres. A combination of articulating sections were employed to navigate the tight opening and launch the machine into its working position. A curved roller door opens over the top of the machine, creating an opening on one side of the peak, with the BMU engineered to fold out to the side then up and over the peak of the roof. This unique building access system matches the building itself for technical engineering achievement and imaginative problem solving to deliver complete facade access within challenging parameters.